From West Africa to Southeast Asia, military coalitions support partners on the ground in driving down the levels of violence arising from the transnational threat so local forces can deal with their own security challenges, the chairman of the Joint Chiefs of Staff said here today. 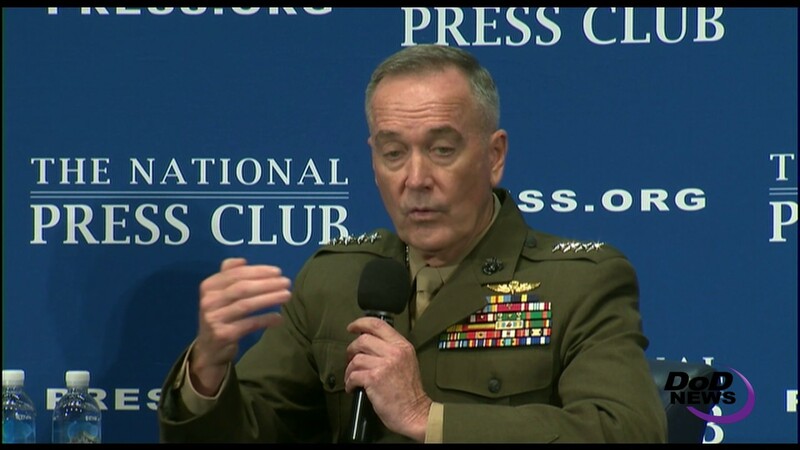 Marine Corps Gen. Joe Dunford spoke before an audience at the National Press Club, discussing the broad design of the campaign being conducted today against violent extremism in the context of all the challenges that face the United States, including North Korea, China, Iran and Russia. Dunford took questions from the audience that began with defeating the Islamic State of Iraq and Syria. 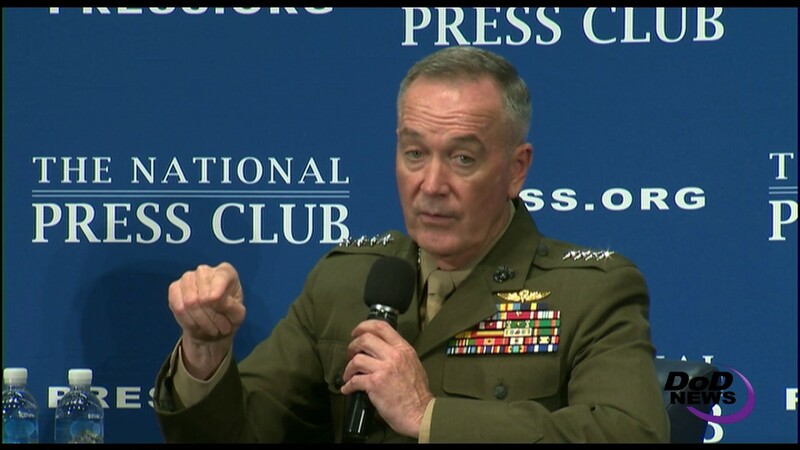 "The United States is supporting the Syrian Democratic Forces in seizing the key Syrian city of Raqqa, Dunford said, noting that the SDF is about 50,000 strong, of which about 20,000 to 25,000 are Arab and the rest are Kurdish. As the U.S.-led coalition supports local efforts to seize Raqqa, another effort led by the U.S. State Department is establishing a governance body, the general said. "That governance will leverage Arab leaders who are from Raqqa and will also work on establishing a security force made up of local personnel so stabilization efforts that will follow the seizure of Raqqa," Dunford added. ISIS is one manifestation of the transregional violent extremism that is devastating cities across Syria, Iraq, Afghanistan and many other countries, he said. What connects extremist groups from West Africa to Southeast Asia is the flow of foreign fighters, the flow of resources and the narrative or message they disseminate, Dunford said, noting that he calls these things "connective tissue between the groups." He added, "Strategically, the idea is to be able to cut the connective tissue … by establishing a broad coalition with a good exchange of information and intelligence so we can get after the flow of money, the flow of foreign fighters and deal with the narrative." The Iraq-Syria coalition has 60 member countries, he said. "I met a few months ago with about 45 of my counterparts from around the world to improve our information and intelligence sharing," the chairman told the audience. "We have an interagency intelligence and information sharing location in the Middle East where right now we have about 20 countries represented militarily and by their intelligence organizations," along with law-enforcement and other national agencies. The idea is that like-minded nations share intelligence and information that will allow for effective military operations, "but also, in effect, a legal framework in countries where foreign fighters either came from or will return to," Dunford said. Combat operations then are designed to enable local forces to deal with specific regional challenges, and there are several regional efforts linked by a strategic framework that connects them, he explained. The strategic framework goes after the three elements that connect the extremist organizations, he said. "The long-term end state of the strategy is to drive the level of violence down in each of the countries where it exists, in each of the regions where it exists, drive the level of violence down and increase the capacity of local forces such that local forces can deal with that challenge," Dunford added. "That's where we're going," he said, "[and] … the majority of fighting -- and the majority of casualties -- are being experienced by local forces that are fighting for their own countries." In Afghanistan, where Defense Secretary Jim Mattis is determining whether to increase the number of U.S. troops on the ground, Dunford said the decision will be made in the context of a broader strategy review for South Asia that is ongoing and is expected to be complete in mid-July. So as Mattis makes a decision about force levels, he will clearly communicate with the president and the secretary of state, Dunford said. In fact, he added, the direction Mattis has received is to do it in conjunction with the secretary of state. "When Secretary Mattis makes the decision about force levels, you can expect that he'll communicate that in a broader context -- again, specifically, the context of that strategy review, Dunford said, adding that the decision "won't be just about Afghanistan." A number of interdependent variables across the region bear on the problem inside Afghanistan, the general said, "and we'll be prepared to talk about those as well when we talk about force management levels." Dunford said he thinks it's important that the conversation about Afghanistan take place in the context of U.S. vital national interests in South Asia as a whole, mentioning two of them. One is the remaining threat from terrorist organizations in South Asia that have expressed a desire to have another 9/11 attack in the United States and to conduct other attacks, the general said. "There are about 17 different groups of the 20 that we've globally identified as terrorist organizations [that] operate in the South Asia area, and continuing to put pressure on those groups is critical and vital to our national interests," Dunford said, noting that he thinks the pressure those groups have been under for the last 15 years has prevented another 9/11. He said the other U.S. interest in the region is preventing a regional conflict in South Asia. When Mattis, Dunford and other military leaders formulate a strategy for Afghanistan, the chairman said, "it’s less about what happened over the past 16 years than it is about our national interests today in South Asia, the context within which we are pursuing our national interests in South Asia, and the diplomatic, economic and military campaign plan that's necessary for us to protect and advance our national interests in South Asia."